Heat oven to 350°F. Spray bottom and sides of 9-inch square pan with cooking spray. In large bowl, stir cookie mix, 1/2 cup butter and egg until soft dough forms. Reserve 1 cup of the dough. To the remaining dough, add mashed banana and walnuts; mix well. Spread in bottom of pan. In medium microwaveable bowl, microwave 3/4 cup of the chocolate chips with the remaining 2 tablespoons butter on High about 1 minute, stirring after 30 seconds, until melted and smooth. Add reserved cookie dough; stir until well blended. 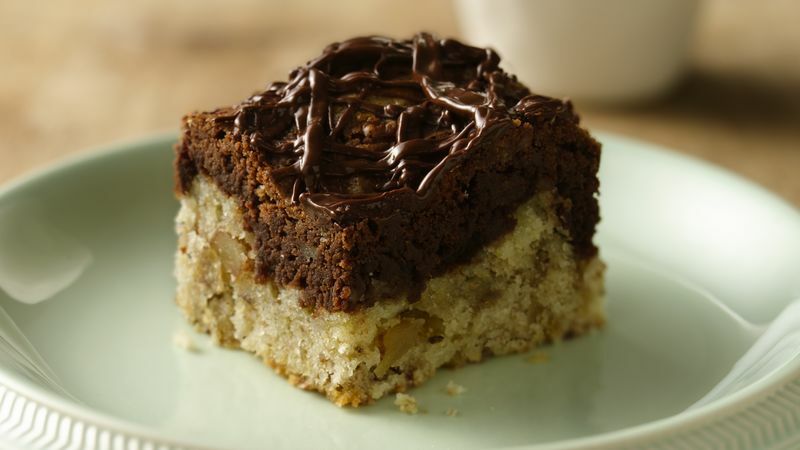 Drop chocolate dough by spoonfuls evenly over top of banana mixture; spread gently to almost cover. Swirl chocolate mixture into banana mixture with knife for marbled design. Bake 35 to 40 minutes or until toothpick inserted in center comes out clean. Cool 15 minutes. In small microwavable bowl, microwave remaining 1/2 cup chocolate chips on High about 1 minute, stirring after 30 seconds, until melted and smooth. Drizzle over bars. Cool completely, about 2 hours. For bars, cut into 5 rows by 4 rows. Store covered at room temperature. The secret to cutting bars easily is to line the pan with foil. Just lift out after baking and cut. Spray the foil for best results. To make drizzling the chocolate easier, put the melted chocolate in a small resealable food-storage plastic bag. Snip off one corner of the bag; squeeze to drizzle.